Glycogen Assay Kit II (Colorimetric) ab169558 provides a simple, fast and robust way to measure glycogen levels in biological samples. This glycogen assay is suitable for measuring glycogen levels in samples that contain reducing substances, which may interfere with oxidase-based assays. In this glycogen assay protocol, glycogen is hydrolyzed into glucose, which is oxidized to form an intermediate that reduces a colorless probe to a colored product with strong absorbance at 450 nm. This high-throughput suitable assay kit can detect 4 - 40 µg/ml of glycogen in samples. 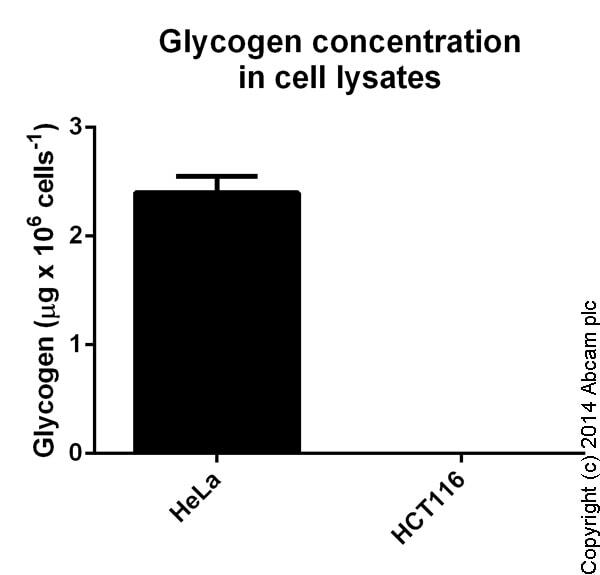 Glycogen measured in cell lysates showing quantity (�g) per 1 mln cells. Samples with the concentration of 1e7 cells/mL (HeLa) and 6.6e6 cells/mL (HCT116) were used. Samples were diluted 2-6 fold. 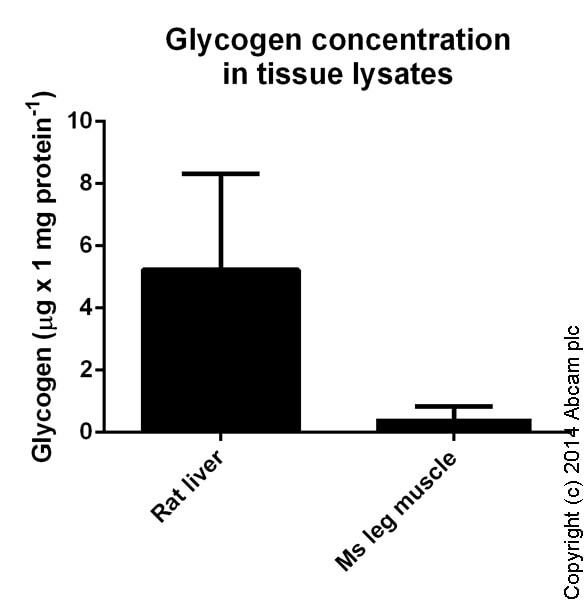 Glycogen measured in tissue lysates showing quantity (�g) per mg of extracted protein. Protein concentration for samples varied from 25 mg/mL to 50 mg/mL. Samples were diluted 2-54 fold. Publishing research using ab169558? Please let us know so that we can cite the reference in this datasheet. pipette, and place on ice to sedate the embryos. -	Take the eppendorf tube containing the embryos from ice, remove as much fluid (fish water/egg water) as possible and add deyolking buffer (*). -	Remove the yolks by triturating with a 200 µl pipette tip. -	Rince twice with ice cold Ringer’s solution. -	Remove as much liquid as possible and put closed eppendorf tube in liquid nitrogen for 10 min, and store at -80ºC. Or: you can proceed immediately with the protocol for Glycogen Assay Kit II analysis. and 2 µg/well Glycogen Standard. Adjust volume to 50 µl per well with Glycogen Hydrolysis Buffer. 10 zebrafish embryos should be rapidly homogenized with 200 µl ddH2O for 10 minutes on ice. Boil the homogenates for 10 minutes to inactivate enzymes. Centrifuge at 14500 rpm for 15 minutes and remove insoluble material. Collect the supernatant. Supernatant is ready to be assayed. Add 10-50 µl samples (~50 µg) into a 96 well plate and bring the volume to 50 µl with Glycogen Hydrolysis Buffer. Add 2 µl of Hydrolysis Enzyme Mix to Standard and samples, mix well. Incubate at room temperature for 30 minutes. Note: Don’t add Hydrolysis Enzyme Mix to the sample background control. Add 48 µl of the Reaction Mix to each well containing the Standard and samples and 50 µl of Background Control Mix to background control well. Incubate at room temperature for 30 minutes. Measure OD450 nm with a microplate reader. Calculation: Subtract 0 Glycogen Standard reading from all readings. Plot the Glycogen Standard curve. If background control reading is significant, subtract the background control reading from sample reading. 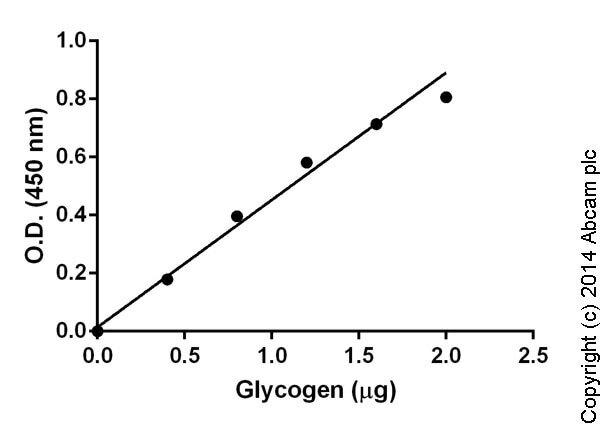 Apply the corrected sample reading to the Glycogen Standard curve to get B µg of Glycogen in the sample. 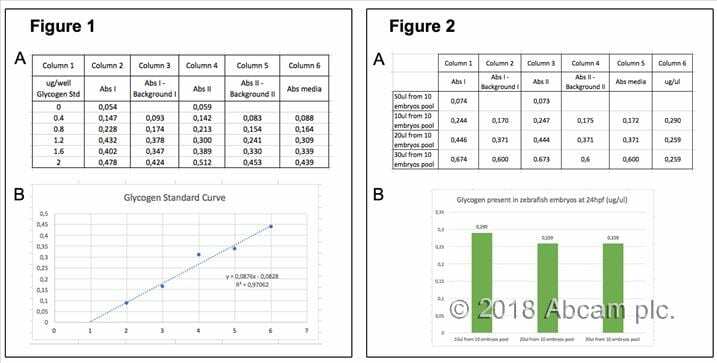 Figure 1 (A) Column 1: ug per well Glycogen Standard, Column 2 and 4: absorbance (Abs) values from first and second lecture, Column 3 and 5: absorbance less background Column 6: media of absorbance values. (B) Glycogen Standard Curve. Figure 2 (A) Column 2 and 4: absorbance (Abs) values from first and second lecture, Column 3 and 5: absorbance less background Column 6: glycogen values obtained applying the formula: C = B (ug) / Sample volume used in the reaction (ul). (B) Glycogen present in zebrafish embryos at 24 hours post fertilization (hpf). The embryos used were zebrafish from AB strain line, breeded in fish water. To obtain 400ml di ½ Ginzburg fish Ringer solution (deyolking buffer) weigh: 1,3 g NaCl; 0,05 g KCl; 0,06 g CaCl2 or 0,08 CaCl2 2H2O; Add milliQ water almost till 400 ml; Add 0,04 g of NaHCO3; Bring to volume (400 ml) with milliQ water; Filter and store at RT. I can confirm that the kit is not species specific so it should be suitable for mouse. It has also been tested for tissue samples, so this wil also be covered by the guarantee. Regarding sample preparation and storage, fresh samples are always preferred over frozen samples. However, frozen samples can also be used, provided, they were frozen right after isolation, were not freeze thawed multiple time (for which we recommend aliquoting the samples before freezing) and have been frozen for relatively short periods.